This first entry is presented by Kathryn Thomas, Senior Prospect Identification Analyst at the Wisconsin Foundation & Alumni Association. She serves as Director, Membership & Marketing for Apra-IL. I work as Senior Prospect Identification Analyst (PIA) at the Wisconsin Foundation & Alumni Association (WFAA). My days follow a fairly familiar pattern as my work is structured in yearly and quarterly projects. What follows is a look at an average day in my role at WFAA. 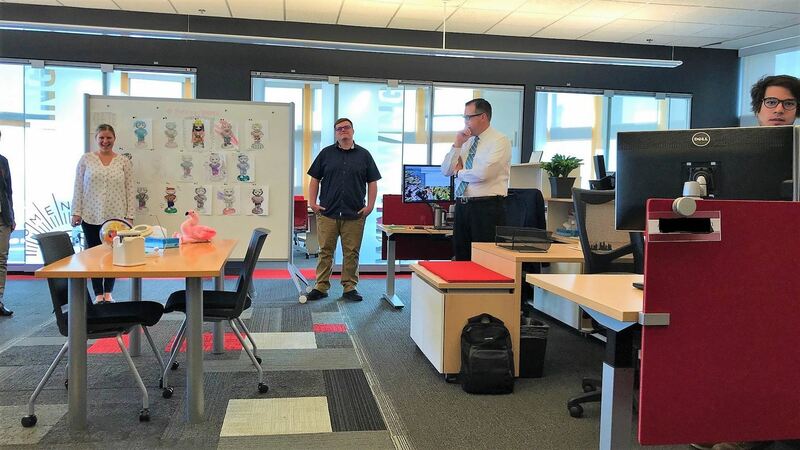 Our work day on the Research & Prospect Management team at WFAA begins with a stand-up in our work space. During this fifteen minute period, each team member shares their triumphs and trials from yesterday and outlines their plan for the coming day. 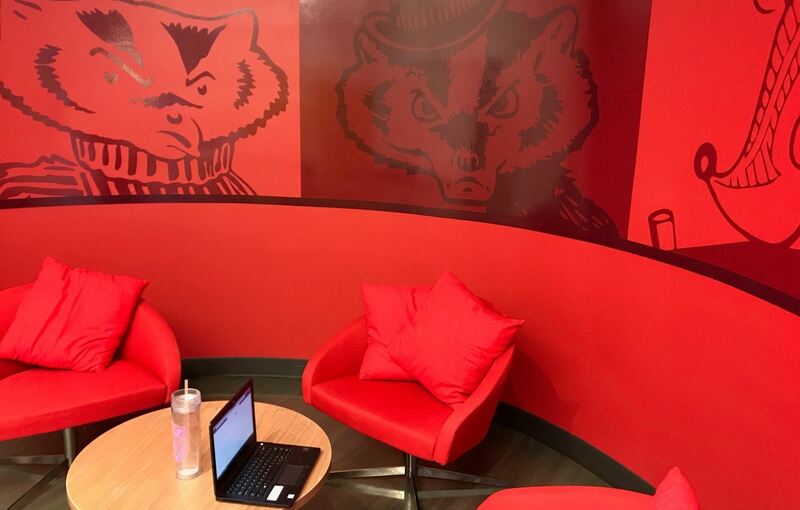 Pictured, you see members of our Prospect Management and Prospect Research sub-groups as well as an array of Bucky Badgers colored during a team-building meeting earlier this summer. My PIA teammate, Emily, and I pull the best prospects for the University using a Tableau dashboard. Pictured above, the dashboard shows assigned and unassigned prospects as well as constituents with no active plans. The top left quadrant has the highest capacity/highest likelihood (based on a major gift likelihood score) and the lower right quadrant shows those with low capacity/low likelihood. 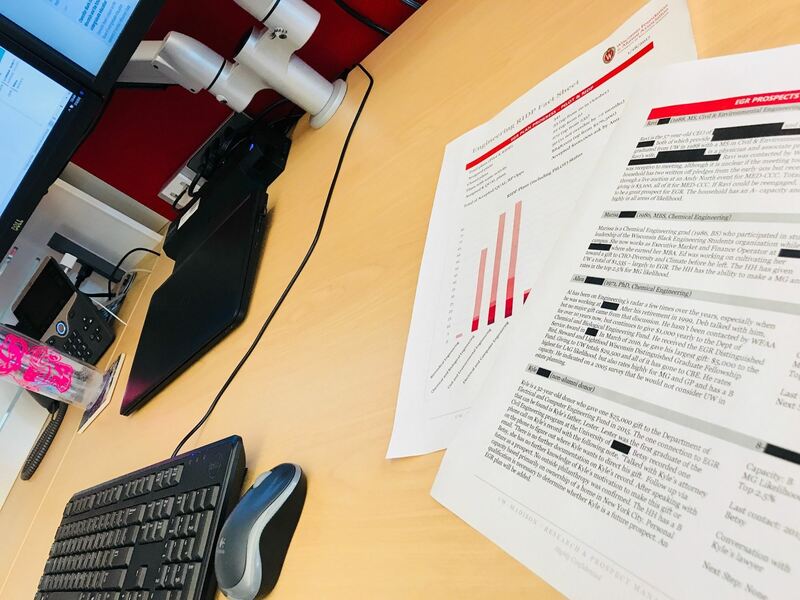 When we are ready to pull constituents for Research review, we click on the boxes we wish to export and download an Excel spreadsheet which details the constituent’s capacity/likelihood as well as their giving to UW and other pertinent details. To learn more about our team’s proactive prospecting process, see me at Apra PD this year! When a constituent is reviewed by Research, they are either qualified (receive a plan for a pertinent unit(s)) or disqualified (receive a disqualification note on the constituent record). After lunch, a colleague and I met in this Bucky bower in the Work Café to discuss our evolving policies regarding constituents marked Not a Prospect. Here at my desk, you can see the one-page report created by the PIA's to take to meetings with Development. In it, we highlight their unit's progress with Research Identified Prospects (RIDPs) and call out specific RIDPs that have yet to be contacted by Development. During these quarterly meetings, we have the opportunity to discuss our qualification methodology and get clarification from Development on specific prospects. After a long day at work, it’s time to head out. As I leave the office, I get this great view of our building and the 1848 and Bucky statue. 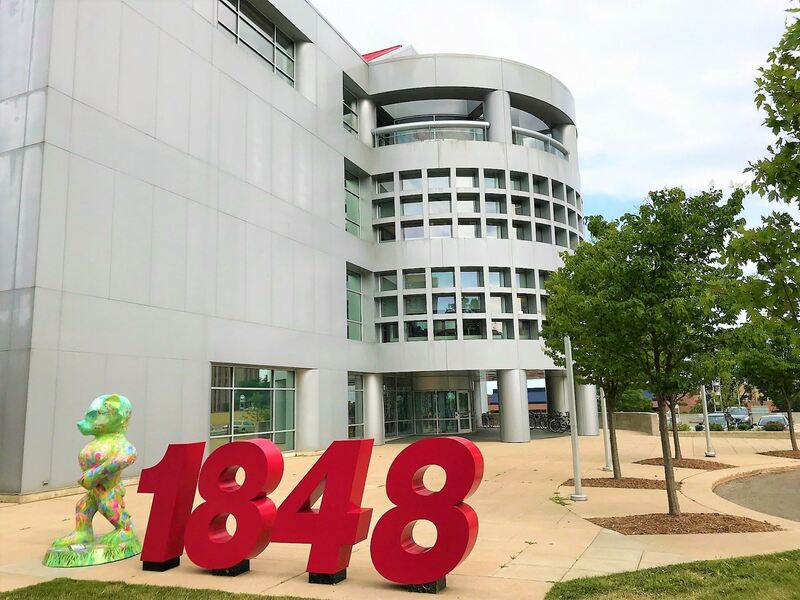 The University of Wisconsin was founded when Wisconsin achieved statehood in 1848 which is why the Foundation address is 1848 University Avenue. Our beautiful flower-covered Bucky comes from a public art event featuring 85 life-sized Bucky Badger statues throughout Madison, WI and Dane County. Our Bucky is called Flamingo Bucky and was inspired by the UW tradition which covers Bascom Hill with plastic flamingos each year. Thanks for walking through a day at WFAA! I can't wait to see everyone else's posts in the coming months! Apra-IL is asking local and national industry leaders what the field means to them and why and how they have pursued success in prospect development. Through this blog series, we will explore what drives industry leaders to propel their careers and prospect development forward. For this month's piece, Joan Ogwumike, Apra-IL member and volunteer, interviews Michael Pawlus, Data Scientist at the University of Southern California. Michael Pawlus is currently a Data Scientist at University of Southern California. Prior to this he was Director of Prospect Development at The Trust for Public Land and before this Assistant Director, Prospect Research and Development at Grand Valley State University. Michael is chair of the 2018 Data Analytics Symposium planning committee. He has volunteered with Apra in a number of other capacities throughout his time in this profession, most recently as one of the faculty members for the 2017 Apra OverDRIVE/ conference. He also served as programming chair on the Apra-Michigan Board and as a member of the first ARC planning committee. Michael has presented on his work at: Apra-International, Apra-Canada, overDRIVE/, DRIVE/, as well as at regional and online Apra conferences. In addition, Michael assisted with the creation of two online training courses, contributed a section to Prospect Research in Canada: An Essential Guide for Researchers and Fundraisers and was featured in an article in the Chronicle of Philanthropy. Michael has a Master’s degree in Librarianship from the University of Sheffield and a Bachelor’s degree from Grand Valley State University. He lives in Greater Los Angeles with his wife, two kids and an orange tabby cat from Korea. Pawlus: My journey all started when I learned about R. I wish I could remember how I first heard about R but I do remember going to the library and getting my first R book. I can recollect so clearly sitting on the #4 Bus traveling north up Eastern Ave in Grand Rapids, Michigan and trying to wrap my brain around the syntax and R basics like vectors and data frames. Even before then I was just extremely fortunate to work at really amazing organizations with really supportive and encouraging supervisors which is luckily still the case. I had the freedom to learn and try out new ideas. This actually started with learning Crystal Reports and then SQL but when I finally started learning R then I felt I suddenly had super powers and I needed to find a place where I could best apply this new skill set which brings us up to the present day. Apra-IL: What does your role as a Data Scientist mean to the fundraising field? Pawlus: It is really encouraging that an increasing number of development offices are hiring Data Scientists. As with so many other sectors, all of us working in nonprofits have access to more and more data but this only has value if we can convert this into actionable information which can best be accomplished through the scientific process. When I used to just do prospect research, the main value that I felt I was adding was verifying data. Knowing that data is accurate is, of course, important however there is a critical next step that was always missing; how much value do these accurate facts have? It always felt like we had these formulas and heuristics that could be applied once we knew some data point however it never felt like these were tested or provable at all. This is when predictive modeling started to become more popular and started to answer these questions. There is so much more to investigate as Data Scientists though and it is such an exciting and fast-moving profession generally and everything happening in this more general space can be applied to fundraising. In addition to discovering the most valuable pieces of data that we have, we can start thinking about how to then use this data and push it to front-line fundraisers. Integrating external data, extracting value from free form text using natural language processing tools and building recommender systems are all ways that we can provide more information to our colleagues and by extension provide a higher level of service to our donors which means our organizations can provide even more to those we serve. Pawlus: I remember being asked why I would want to leave prospect research to start doing data analytics or data science. 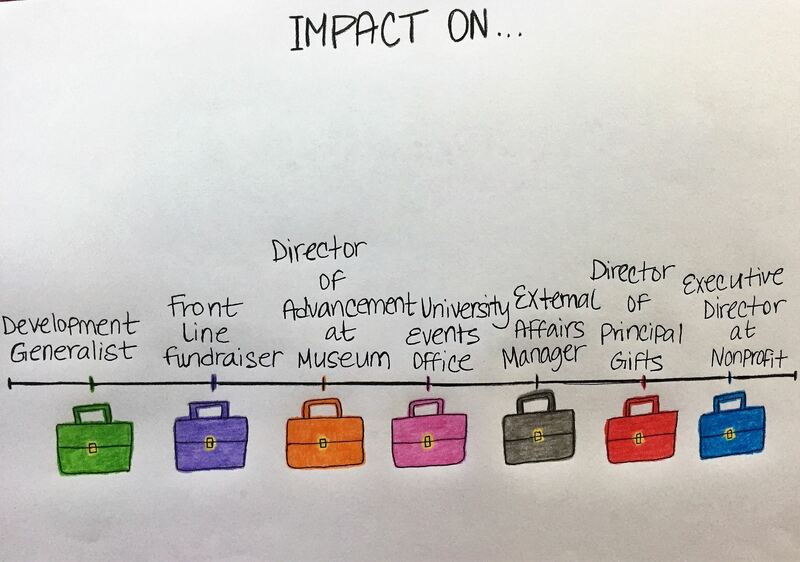 I was always a little confused by the question because I think I am still essentially accomplishing the same aims as I was when I was in prospect research except now I can I can complete tasks at scale and provide a wider assortment of services but I am still providing fundraisers with actionable insights. In theory, analytics is one of the three main branches of prospect development along with prospect research and prospect management. However, in practice, it always feels like analytics is off on its own island. It has a separate email list and separate conferences. I am not saying that everyone needs to become a data scientist however I think we should all know a little about what we all do. Since the World Cup is right around the corner, I feel it is safe to use a soccer metaphor. In soccer, there are ten outfield players and some specialize in defense and some specialize in scoring but those that play in defense can still score and forwards need to be able to get back and help defend at times. The best teams are well-rounded and versatile in this way and I feel this would also be true for prospect development teams. Apra-IL: What is something interesting you learned within your role this month? Pawlus: I just learned about graph databases which are a different way of storing data that allows you to travel from node to node along relationships to find objects that are several degrees removed. This is similar to relationship mapping but imagine applying that to everything. You can also use these graphs to do something like this: let's say there are a group of foundations that give to your organization and these foundations also give to other organizations of course but then let's say there are foundations that give to those same common organizations that you discovered but they don't give to you; well these foundations might be good prospects for your organization and using graphs you can find these. Also, I can't say I completely understand this yet but I have been learning more about this model called GloVe (Global Vectors for Word Representation) which essentially creates this matrix that quantifies the similarity between terms which is really helpful when you are topic modeling on survey data or contact reports. Using the example from the authors of the model, GloVe shows that Litoria and Leptodactylidae are related to frog and it can do this with other word and term groupings which wasn't really possible before. For those working in health, it is possible to find terms that all reference a similar medical condition without having expert subject matter knowledge using pre-trained word embeddings that have been done on the entire Wikipedia corpus for example. I am sure I will look back at this in a month or two and realize I could have explained both of these concepts much better but then I will be on to learning new concepts and techniques. That is the way that it is right now there is just so much out there to learn and tons being developed constantly. It’s a great time to be a data scientist! For this month's piece, Joan Ogwumike, Apra-IL member and volunteer, interviews Jill Meister, Executive Director of Advancement Services at Adelphi University in New York. Jill began her development career in 1991 when she joined the development office at the School for International Training (SIT) in Southern Vermont. She moved on to Landmark College in 1994, also in Vermont, and prospected lead donors for the first campaign ever at Landmark. In 1996, she joined the research office at the University of Massachusetts Amherst and became the Manager of Research Services in 1997. In 2001, Jill moved to Rhode Island and became the Director of Development Research at Bryant University. Jill was the Assistant Director of Prospect Development at Brown University from 2003-2007, Director of Research and Advancement Services at The Williston Northampton School from 2007-2013, and the Director of Prospect Research and Management at the University of New Hampshire from 2013-2017. She currently works as the Executive Director of Advancement Services at Adelphi University in New York. Jill received a B.S. in Business Management from Franklin Pierce University, and an MBA from the University of Massachusetts Amherst. Jill is a director of Apra since 2011, served as President during the 2016-2017 year, and is the current Immediate Past President. She was the chair of the 2011 Apra International Conference Curriculum Committee, was a member of the 2010 Apra International Conference Curriculum Committee, and a founding member of Apra's Marketing and Branding Committee. Jill is a former director of NEDRA, and a past president of the NEDRA Board. Apra-IL: In your Apra 2015-2016 Board of Directors biography, it reads that you have more than 20 years of experience in development and fundraising. Can you tell us what has kept you motivated all of these years? Meister: What keeps me going is that through the work of philanthropy, we are ensuring access to education, health care, social programs that better people’s lives, and preserving the arts. Our non-profit organizations are important and have a positive impact in the communities and world that we live in. I like being a part of something larger than myself, and by continuing to work in philanthropy, it matches my vision to help the world and make it a better place. In addition, by being part of Prospect Development, I am helping to create scholarships or a new building that we are raising funds for that make a difference for many people. I like to see the fruits of our labor. Apra-IL: What role has Apra played in your professional journey? Meister: Apra has played such a huge role in my career. My first Apra conference was 21 years ago in Pittsburgh. I remember being so blown away by the scope of the conference and seeing all these different professionals in Prospect Development. I learned so much from the presenters and from the people I met. It truly helped me build my network. Early in my career, a much-esteemed member of the profession asked me, "When are you going to present at an Apra conference; when are you going to get more involved?" Every year he saw me he would challenge me to raise my sights. I volunteered at the Apra conference; I became a board member of my local Apra chapter (NEDRA), I presented, and took on more volunteer roles that had increasing involvement. The best part of being a volunteer was I learned even more and it directly helped me in my career. Being part of Apra comes with so many benefits. And, when I attend the Apra conference this year, I know I will still have the same feeling I had when I attended my first conference. Apra-IL: So far in your career, what has been your biggest challenge or lesson? Meister: Well, there have been many challenges! However, I believe this lesson can apply to all areas of our lives – learning there is always someone who knows more than you do. To restate that: recognizing that the collective knowledge and viewpoints are better than an individual one. There is more than one way to do something, and once I put myself in a fundraiser’s shoes, once I began to collaborate with my colleagues, it made me a better researcher. Every day there is something to learn, a new way of doing things and trying out new ideas. This is how we grow. Apra-IL: What is next for you? Is there anything you would like to accomplish or a new challenge you'd like to take on? Meister: I have just taken on a leadership position at Adelphi University. I am part of the leadership team that, with the VP, leads the advancement office. It is an opportunity for more growth and change. My involvement with Apra has helped me to get to this point, and will continue to help me in my new role. I am a big advocate for Prospect Development and Apra, and I think in my new role, I can have a bigger voice and advocate for our amazing field! In any field, your journey may feel like a never-ending trek up-hill as you grow, advocate, and demand equality and equity in your field. In Prospect Development, we face these issues and more (as illustrated above). Above, we spotlight just a few of the obstacles PD professionals face in their journey to the top. What have you overcome to get where you are today? Share with us below! The field of Prospect Development, in name is still growing; but in theory, it has supported and made great impact on different areas in Development/Fundraising for decades. 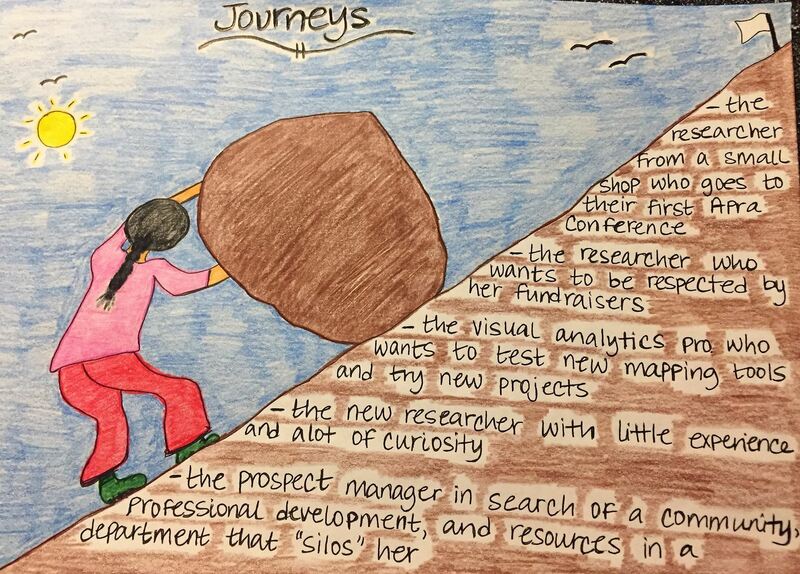 From the Development Generalist, who wears many hats, to the External Affairs Manager who works to prioritize outreach with curated lists from Research, to the Executive Director at a nonprofit who uses analytics and research to drive the mission - all the fields or offices represented, and more have in some way utilized the skills of Prospect Development professionals. And Apra-IL recognizes your consistent impact. For this month's piece, Joan Ogwumike, Apra-IL member and volunteer, interviews Mallory Lass, Assistant Director, Prospect Research at the University of California Berkeley. Mallory Lass is Assistant Director, Prospect Management at UC Berkeley, where she also supports regional fundraising efforts in Los Angeles and the Bay Area, and the Vice Chancellor for Research Office. Mallory works with her fundraising clients to provide comprehensive prospect management, prospect research, and data analytics services. Mallory started in prospect research as a student worker at UC Santa Barbara and was able to embark on a career in the industry after graduation. She returned to Prospect Development after she took a career detour as an estate planning attorney, where she was also involved on many community boards. Mallory joined the board of CARA (California Advancement Research Association) in 2014 as the Northern California Regional Chair. She is the immediate past President and current Communications Chair. Apra-IL: Two-part question: Why Prospect Development? And what has kept you motivated? Lass: I actually got involved in fundraising as a student. I attended UCSB and was looking for a student job and saw a posting that basically said computer proficient, so I applied. It ended up being in Prospect Development, and it opened up my world a lot. I took a detour to law school and practiced Estate Planning for a few years; in part because of the inspiration I had from fundraising and advancement to help people realize their goals. Ultimately, I was called back to the world of Prospect Development and have always been in Higher Ed because public education is my passion. Literacy and access to education are really important to me, so the students keep me going. The seemingly never-ending slew of world problems we have yet to solve are also a source of motivation. I know I am doing work that has wide-reaching effects, which will ultimately touch thousands of people. I don’t think everyone gets to say that about their job. It really is mission driven work for me. I find it intellectually stimulating even though it can also can be quite theoretical. Apra-IL: What role has Apra/Cara played in your professional journey? Lass: I certainly wouldn’t be where I am today without the Apra/CARA community. I remember, even back when I was a student worker, the woman who ran our prospect management program at the time attended Apra and came back full of new ideas. It sounded exciting, and I remember how nice she said everyone was, and that has always been my experience with the community; so willing to help and share information. As a life-long learner, professional development is something I am really passionate about. More than that, I think these organizations create a space to build community. Even though it seems like it sometimes, we don’t operate in a vacuum. We have peer institutions, parallel and intersecting missions, etc. and there is something really comforting in that. As our community grows and becomes more vibrant, there is no better place to be than in the mix at Apra PD or a CARA conference and seeing everyone so engaged and genuinely happy. Lass: I know there are stories about encounters with people in the outside world who have some perception of Prospect Development, but I would say for the most part, people have no idea that this is even a profession, nor what the day-to-day work is like. From early on, when I first got into this industry as a student, I created a little elevator pitch about what I did. The elevator pitch of my youth was certainly full of more snark and even some cringe-worthy language. But I have spent a lot of time now educating the general public/friends/family about philanthropy, even if it is with more professional language and the short pitch works. I can always go into more detail if people are interested. I continue to discuss the importance of private support for public education, the importance of supporting organizations and causes whose mission aligns with your own values, etc. I think from within other areas of advancement, people are not always sure what we do over in prospect development. So, it is a little bit about demystifying our processes. Doing proactive education is a big help. There is no magic box, we work really hard to gather and analyze data and provide key insights into our strategies and prospects. Apra-IL: Fill in the blank with a piece of advice you wish you had received in your first Prospect Development role: When in doubt, ___________. Lass: When in doubt eat ice cream. Everything we do (okay, mostly everything we do) is important, or can be traced to an important outcome. That said, sometimes we can take ourselves too seriously. When I get stuck on a problem, a prospect research request, a data project, have a challenging meeting, etc. the best thing for me to do is take a break and stop thinking so hard about it. Most of the time, the problem will still be there when you get back. For me, my happy place is eating ice cream, so I either grab some co-workers to join me, or just go it alone. I have been known to “schedule” ice cream related meetings into my calendar when I know I have a ton of non-ice cream related meetings, or a big deadline. The real advice here is give yourself and the people around you a break. Our work is important, but nothing is worth an ulcer. Okay, the real, real advice is to eat more ice cream! For this month's piece, Joan Ogwumike, Apra-IL member and volunteer, interviews Kevin MacDonell, Acting Executive Director, Advancement Operations for the Advancement Department of Dalhousie University in Halifax, Nova Scotia. Kevin MacDonell is Acting Executive Director, Advancement Operations for the Advancement Department of Dalhousie University in Halifax, Nova Scotia. Formerly a journalist and editor, he entered higher education advancement in 2003 as a communications writer and later moved on to prospect research, annual giving (phonathon), and business intelligence. Along the way, he pursued an interest in data analysis, data mining and predictive modeling and applies these techniques to support all areas of university advancement. He launched the CoolData blog (cooldata.org) in 2009, focused on promoting the learning of predictive modeling techniques for professionals working in advancement and other nonprofit organizations. He has given many conference presentations on these topics, and in 2014 he was co-author (with consultant Peter Wylie) of a book published by CASE called “Score! 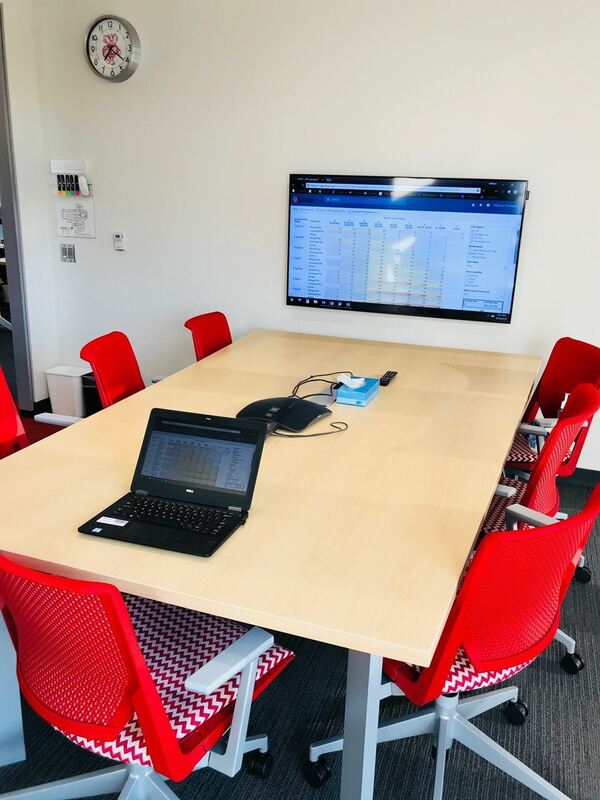 : Data-Driven Success for Your Advancement Team.” Most recently, he published a how-to guide for predictive modelling as a free download from CoolData.org. Apra-IL: Describe your motivations to build your career in Prospect Development, and what keeps you engaged? MacDonell: My career has not been focused solely on Prospect Development, but it is fair to say that it has always revolved around it. I was a prospect researcher for seven years with responsibility for what, at the time, I didn’t know to call prospect management. Later, I worked in Annual Fund, data analysis, and managing teams in Operations (a.k.a. Advancement Services). None of those roles was really separate from Prospect Development, in the big picture: Annual Fund is part of a process that should identify key donors early and engage them appropriately; my data analysis work was in support of the same process, and Advancement Services professionals should be focused on supporting the smooth working of the “pipeline,” in its broadest sense. My path through Advancement hasn’t been an outcome of a career built according to plan. I have moved from opportunity to opportunity. But the common thread is the satisfaction I receive from mobilizing data and information to enable leadership and frontline staff make decisions and support strategy. I’ve enjoyed learning new things, working on interesting problems with other people, and being useful in general. That has spilled over into my blog, the book I co-wrote with Peter Wylie, and the new (free) book I’ve just self-published. Of course, those traits are true of anyone who enjoys coming to work each day, but the best people have those in spades. They are all intrinsic rewards of work. Nowadays, part of my role is to hire for that orientation toward intrinsic rewards, among other traits (including being smarter than I am). Apra-IL: In your career, what has been your biggest challenge or lesson? MacDonell: My biggest challenge was negotiating the transition to managing a team when all my previous experience related to hands-on work. This is a common problem - I’ve seen other new managers struggle with it - and I think it’s especially true for knowledge workers who may be managing a team but still have all the tools of the trade right there on their desktop. It took a while to feel right about letting go of things I once enjoyed, such as doing data analysis. It is possible to retain some elements of hands-on work, but I found that I couldn’t work on a priority project without becoming a bottleneck to progress. In roles I’ve had in recent years, holding on to any of that would drain energy from where it’s really needed: ensuring I understand where the frontline part of the organization is going, and being out ahead of it to support it, and proactively plan. Apra-IL: In three words, describe the role of a Prospect Development Professional. Apra-IL: Please share a piece of advice with our readers you gained through a professional development opportunity. MacDonell: I’ve attended many Apra conferences and sessions as an attendee and speaker, so professional development from Apra has shaped my view of Advancement in important ways. However, having seen prospect development from various angles, my advice to experienced people in the field is not to limit your view to what’s going on in Prospect Development to the exclusion of awareness of the strategic direction your department or organization is taking. I think of Apra as being forward-facing and in the vanguard of developments in the field, but we have to acknowledge that as much as we crave appreciation and respect from Advancement leaders, Prospect Development professionals are in service to their organization’s strategy. We may have had a hand in developing that strategy, but ultimately, strategy is developed by the organization’s leadership. It’s analogous to something I like to say about an area I feel affinity with: data analysis and business intelligence. I have stopped using the term “data-driven decision making” in favour of “data-informed” or “evidence-based” decision making. Data doesn’t “drive” decisions, it “informs” them. Advancement leaders need to, well, lead – that is, chart a course. Analysts supply some of the tools, information, and advice to keep the ship on course. So it is with Prospect Development. A high profile for the people doing the work is important, but it is equally important for those folks to understand and support the strategy, and plug into it in proactive, effective ways – rather than seek to bend the organization to their concept of best practice. Prospect Development can show leadership where strategy is lacking, but otherwise it’s best to be in tune with the overall plan. There are issues with communication in every field. 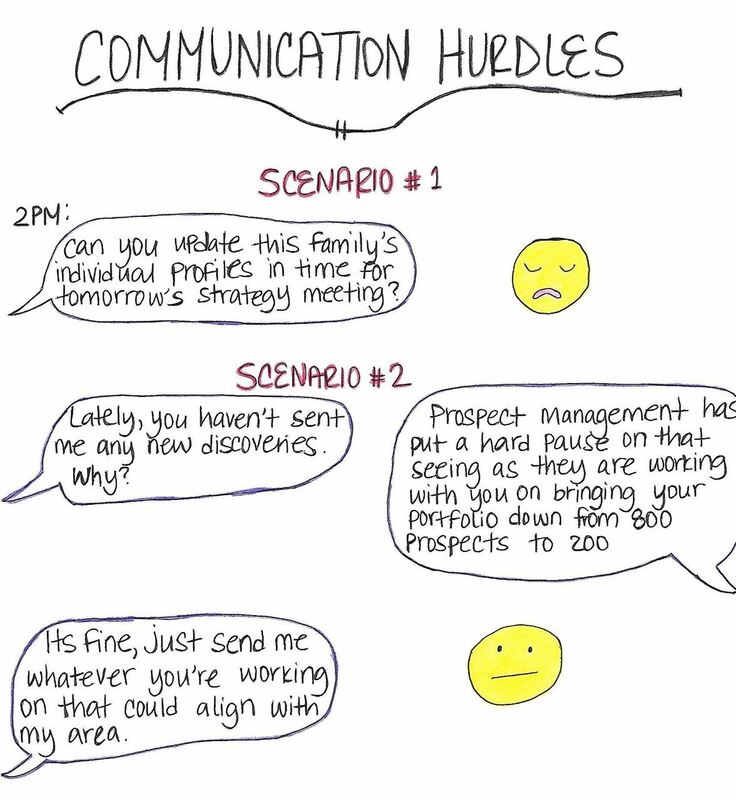 Understandably, Prospect Development has an issue with overcoming these one-way communication hurdles. We face obstacles when advocating for professional development, balancing our work and life, and a lack of respect for our work and voice. These burdens can begin to feel too heavy when carried alone. Apra-IL is here for you! We serve as a community of like-minded professionals always willing to meet up, reach out, and assist when asked. 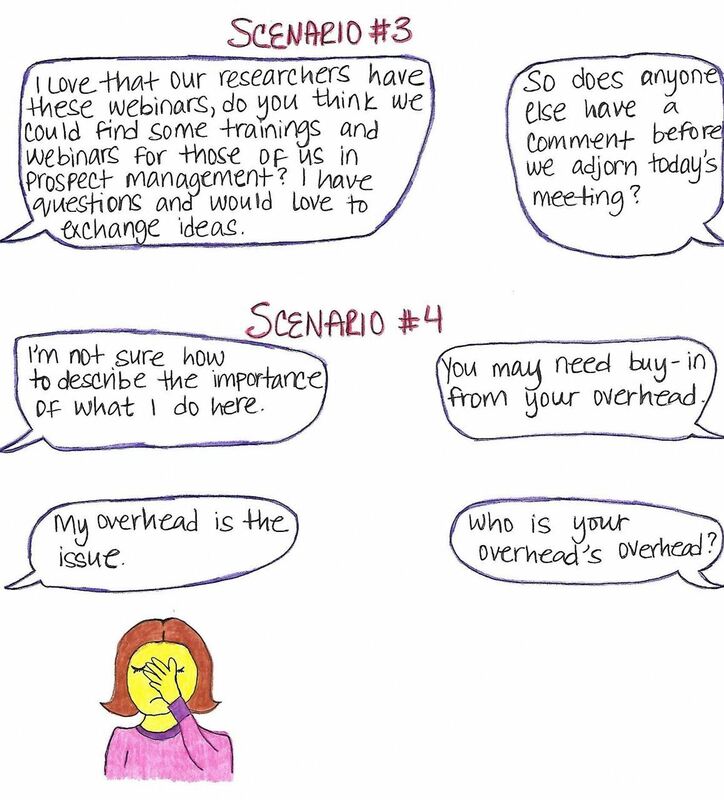 Have you faced any of the above scenarios? How did you overcome? How can Apra-IL help? Let us know in the comments below. As professionals in Prospect Development, we have opportunities to learn continuously through webinars, conversations with colleagues, and conferences. Through those resources, we are able to celebrate the creation and discovery of new resources, wrestle with changes in tax law, and analyse wealth/capacity calculation advancements. 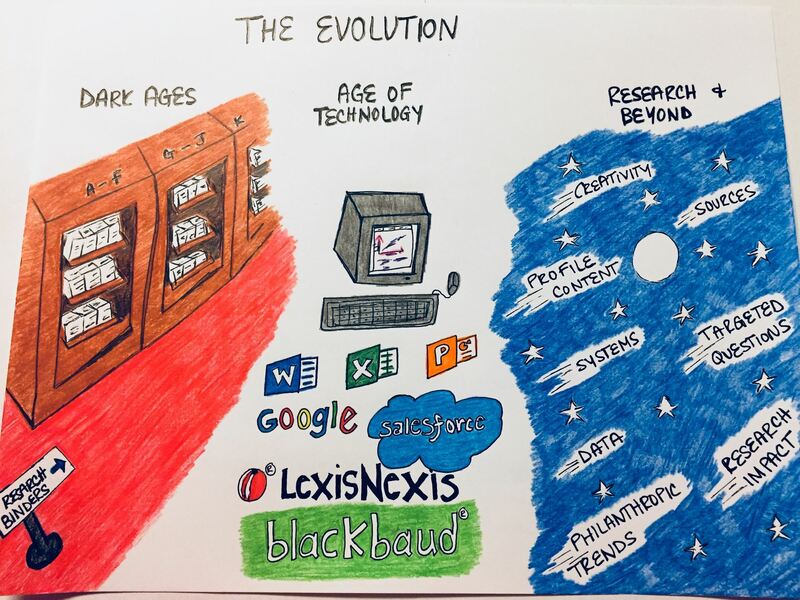 The above illustration shows how far we've come as a field. Throughout the history of the field, we've utilized new tech to store our records more efficiently, found new ways to work with our colleagues in libraries, and collaborated with vendors to build systems that (while often full of quirks and frustrations) surpass the wildest dreams we would've had 10, 20, or 30 years ago. Take some time today to celebrate the advances we've made and the ways these technologies have changed the way in which we do our good work. Celebrate, also, the potential in our field. Can you see ways in which you and your colleagues are working to alter the path of Prospect Development? Share them with us! What do you think the future of Prospect Development looks like? In what areas have you seen growth that you never could've dreamed of only years earlier? Do you think AI and robotics will someday take over our roles as researchers and strategists?